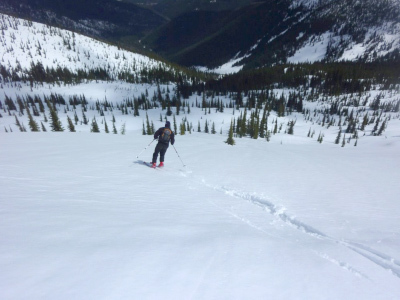 With ~1200m elevation gain over 10-11km to reach the summits of Cabin or Midday Peaks from the car, most folks won’t be day tripping into this area without mechanized help, but an overnight at Huckleberry hut puts a lot of great skiing in easy reach. 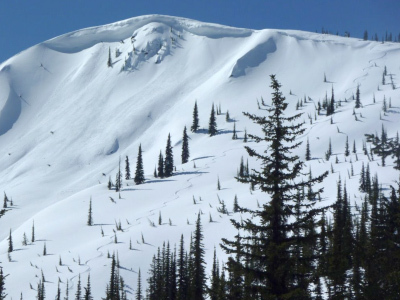 The local peaks offer easy ascents with great views and fun skiing down a variety of pitch angles in open bowls or gladded trees. The area is unique in that you can find skiing on every aspect. 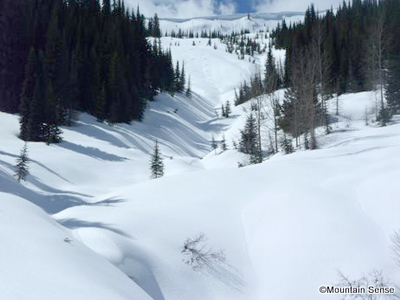 Although not a heavy use area, Snowwater Heliskiing’s tenure does extend into the region and currently (spring 2011) there is motion towards a catskiing co-op which has made for easy access up the groomed logging roads, but also increases sledder traffic and will ultimately increase area usage on runs that offer pickups on a logging road. For more information on Huckleberry Hut have a look over here adn for the full details on the Bonnington Traverse check out the Bonningtron Traverse Page here. All routes listed here provided by Shaun King of Mountain Sense. If we have missed anything please let us know? 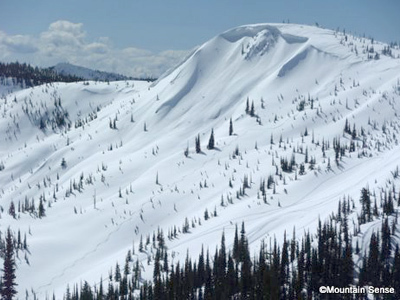 The south ridge of Dominion offers an incredible run of nearly 800m of consistently angled fall line skiing! From the hut, follow the logging road (shown on the map) up switchbacks to the Cabin-Midday Col and continue along the logging road as it wraps around the basin between Dominion and Cabin Peak on the 1840m contour line. 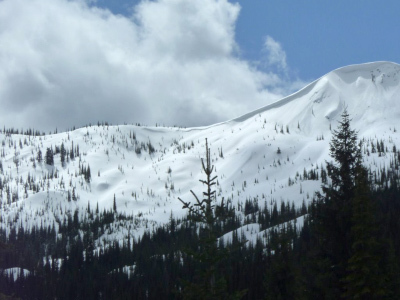 There is exposure to big steep ESE facing slopes off of Dominion before the SE face is crossed and eventually the south ridge which is the lowest angled terrain for ascent to the top. A less exposed and more direct alternative is to ski down off the road below Cabin Peak and skin up the other side towards the south ridge although this may add ~200m of elevation to your day. After your amazing descent down the south ridge to ~1400m, skin up the east fork of Craigtown Creek back to the Cabin-Midday Col and down to the hut. When the coverage at lower elevations (1200m) is good enough to fill in the creek, a fun exit is to follow the main Cabin Peak drainage south of the hut down to the valley bottom. Staying high on the right of the drainage gives good skiing when the creek steepens up. Lower down regain the creek and contour north at ~1200m to pick up the flagged start of an old logging road just north of the confluence with Barrett Creek. Follow the road a short distance to a fork. The left climbs north to a point where the main access road passes within 10m at ~1280m. The right slowly descends for ~1km before you will want to contour through the forest at ~1120m to regain the main road before it crosses Lost Creek. The obvious choice for great fall line skiing that leads back to the hut on the SE and E aspects, but there is also nice low angle skiing to be had on the SW side. A gentle angle of ascent and great views make for a very enjoyable outing. The plum line for 500m of great fall line skiing down open slopes off the picturesque summit that take you right back to the hut! From the hut, follow the logging road (shown on the map) up switchbacks to the Cabin-Midday Col and continue north to the summit. 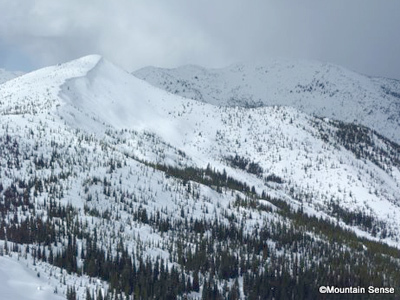 Now carefully make your way east past cornices on your right and left to access the first long, steep (and committing) slope. Below, more fall line skiing leads over a couple convexities and through a patch of trees before more open slopes and a gully which spits you out on the logging road slightly uphill of the hut. Pleasant low angle skiing off the summit to the SW leads to a logging road at 1840m that can be followed back to the Cabin-Midday Col. Alternatively continue down below the road where the angle steepens to double the run length. Access this route from the Huckleberry Hut by following the logging road (shown on the map) up switchbacks to the Cabin-Midday Col and continue north to the summit. 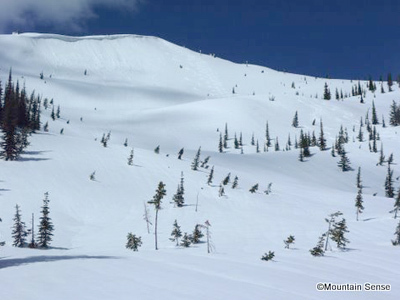 Miles of great tree skiing & open glades can be found off the south ridge of Cabin Peak. From the hut, follow the logging road (shown on the map) up switchbacks to the Cabin-Midday Col and continue climbing north to the flats above the 1920m contour line. Pick your line dropping east off the ridge and down through trees (further south) to the logging road, or open glades (further north) to the gully that drains the SE bowl of Cabin Peak. The other obvious objective from the hut, Midday Peak offers great skiing on a variety of aspects. 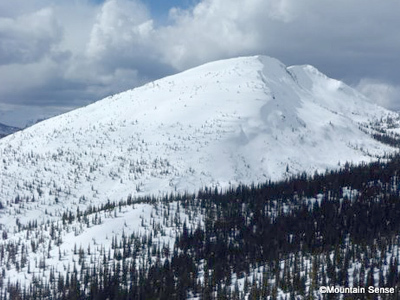 From the hut, follow the logging road (shown on the map) up switchbacks to the Cabin-Midday Col and continue south to the summit staying clear of cornices on your climber’s left while ascending the initial steep ridge. From the top of the initial ridge (NW sub summit) good skiing can be had by dropping NW through steeper, sparse trees. 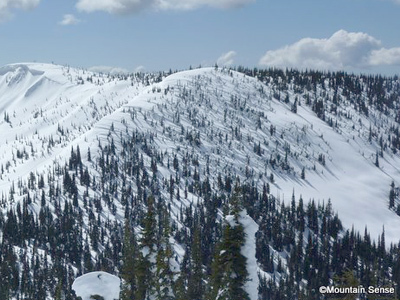 If this slope is wind affected, head down further skier’s left in the thicker trees until the terrain flattens out. Skin back up to the Cabin-Midday Col to reach the hut. To access this route from the Huckleberry Hut, follow the logging road (shown on the map) up switchbacks to the Cabin-Midday Col and continue south to the summit staying clear of cornices on your climber’s left while ascending the initial steep ridge. 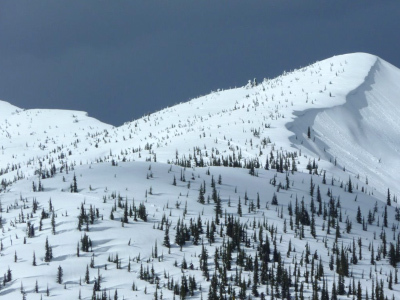 Large cornices flank the NE aspect off the summit of Midday Peak, but you can ski north past the cornices and drop into the NE Face between the main summit and NW sub summit. Continue down and work left to regain the road to the hut or skin back up to the col for another run. To access this route from the Huckleberry Hut, follow the logging road (shown on the map) up switchbacks to the Cabin-Midday Col and continue south to the summit staying clear of cornices on your climber’s left while ascending the initial steep ridge. From the summit ski a pitch to the SE down to the lower ridge. From here many possibilities exist for good skiing down into the NE bowl. To access this route from the Huckleberry Hut, follow the logging road (shown on the map) up switchbacks to the Cabin-Midday Col and continue south to the summit staying clear of cornices on your climber’s left while ascending the initial steep ridge. All routes listed here provided by Shaun King of Mountain Sense.